Researchers from Rice University have discovered that hexagonal Boron Nitride (h-BN, which has a similar structure to graphene and is sometimes referred to as "white graphene") may be used as a very effective anti-rust metal coating that can prevent the metal from oxidizing at very high temperatures (up to 1,100 degrees Celsius). Even while layer of h-BN may be enough to be used as a protective coating. The researchers made small sheets of h-BN on nickel foil using CVD. They say that the process should be scalable for industrial production. 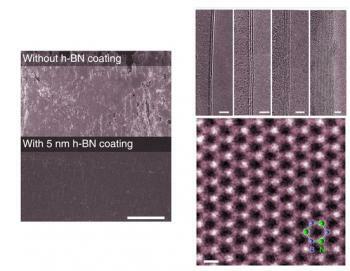 The researchers also tested growing h-BN on graphene, and transferring h-BN sheets to copper and steel.